The Israel Patent Authority is going to be closed on Tuesday, 22 January 2013, because of the General Election.All deadlines falling on the 22 January 2013 get automatically extended by a day, so Paris Convention and PCT deadlines falling on 22 January 2013, may be made on Wednesday 23, January 2013. For some reason I find difficult to fathom, it seems to be too much to expect the electorate to work and also to vote on the same day. I remember that in the UK, General Election Day was not a public holiday. Apart from the Pirate Party (which is not expected to clear the electoral threshold), none of the parties have clear positions on intellectual property. 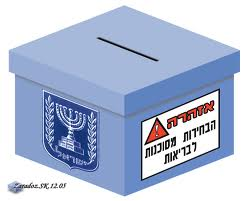 It seems that the issue of national service for ultra-orthodox and minorities, and taxation policy are of more interest to the general public. 1. The population receives the government it collectively chooses. 2. 4 or 5 years later, one gets a further opportunity to change the government.